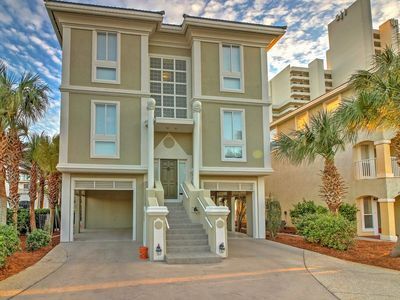 Designer 6 Bedroom Home w/ Electric Cart, Gourmet Kitchen & More! 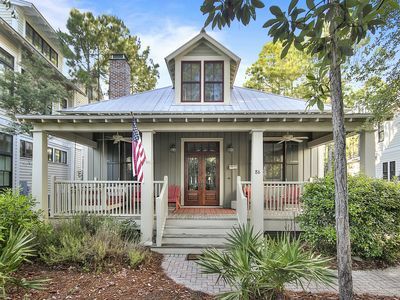 Nestled in a premier location within WaterColor’s Lake District, 349 Needlerush Drive illustrates coastal living at its finest. Soaring twelve-foot ceilings accompanied by wooden beams and custom trim detailing makes for a grand entrance into this upscale home. 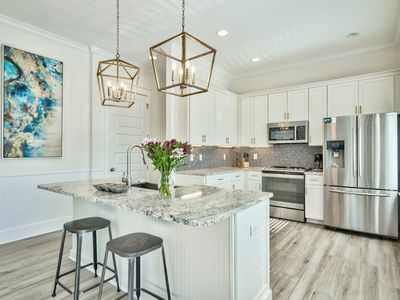 A boundless blue backsplash adds an elegant touch to the gourmet kitchen featuring lavish granite countertops, custom cabinets, premium gas stove and Sub-Zero refrigerator. 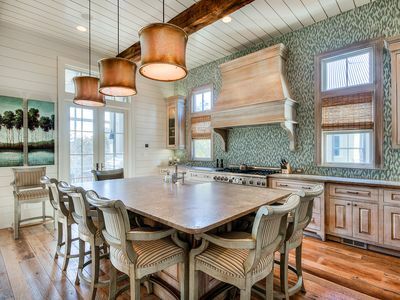 The oversized kitchen island will comfortably seat seven in addition the dining area while you share delicious food and savory drinks over good conversations with family and friends. 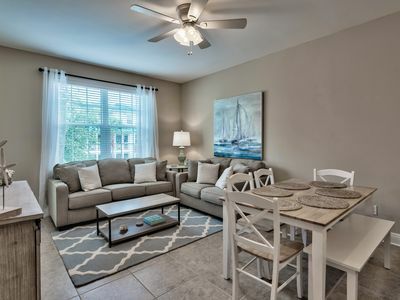 Make your way over to the living room to find the perfect gathering spot to relax on ample plush linen sofas and catch your favorite film on the flat screen television hoisted above an alabaster white gas fireplace. 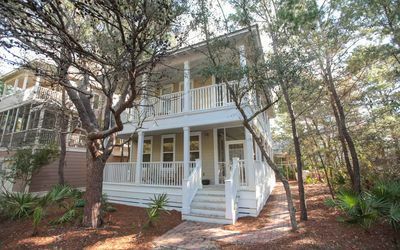 Enjoy the beautiful outdoors by stepping out to the screened porch that features a wood burning fireplace along with two outdoor couches, flat screen television, built-in gas grill and outdoor breakfast table. Located at the front of the home is a convenient guest bedroom featuring a king bed and private bathroom with a sizable walk in shower. The first floor of 349 Needlerush Drive additionally hosts an oversized laundry room and half bath. 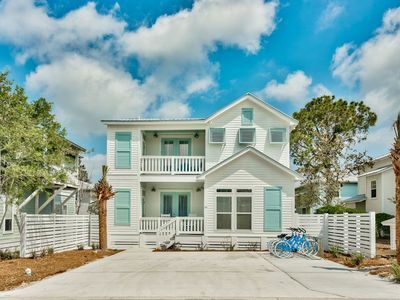 Stroll to the second floor to find the well-appointed master bedroom hosting a king bed, small sitting area and a private bathroom with a large soaking tub, custom double vanity and walk-in shower featuring a rain shower head. 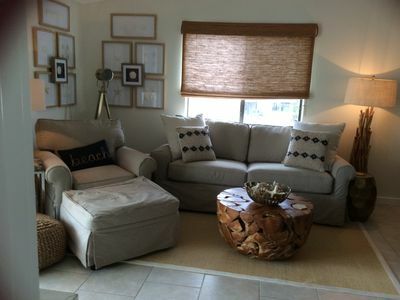 The master bedroom also has exclusive access to a private screened porch ideal for enjoying tranquil time alone. 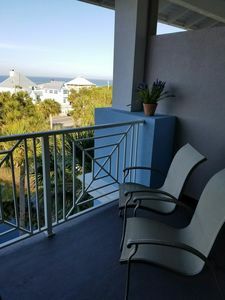 Two additional king guest bedrooms are located just down the hall, both hosting ensuite bathrooms with walk in showers and access to a sprawling balcony with surfboard inspired furniture, mounted flat screen television and a swinging day bed. 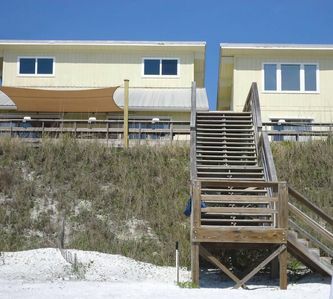 Across the hall, a spacious bunkroom is present with dual twin over twin built in bunk beds that sleep a total of four. 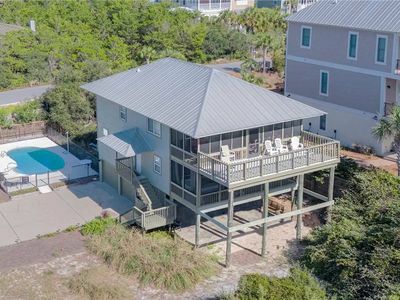 The third floor of this home is guaranteed to please with its second living area integrating a set of four twin beds serving as both an oversized lounge and sleeping space that surrounds a large flat screen television with video game station. 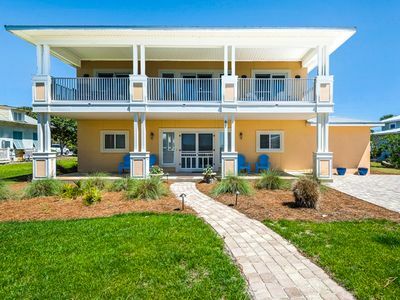 A queen bed is also positioned across the room by the stretch of windows and hosts a beautiful view of the protected woodland and miles of the 499-acre community of WaterColor in addition to a large private bathroom with double vanity and walk in shower. 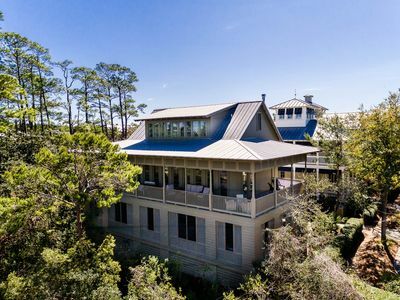 An added bonus of this third-floor oasis is an additional private room hosting a ping pong table and a small cozy viewing nook as well as a separate spiral staircase that takes you to the fourth floor of the home, a spectacular cupola paints a perfect panoramic view of WaterColor and an amazing spot to watch an emerald coast sunset. 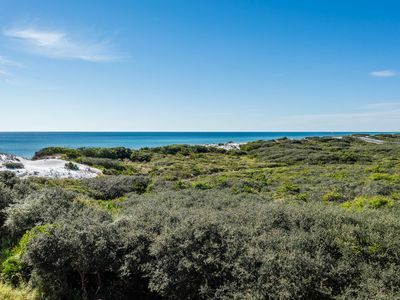 Enjoy the added luxury of 6-passenger golf cart as you cruise through 30A to the many pools and famous beach club of WaterColor. Be among the first to experience everything that 349 Needlerush Drive has to offer. Trust us, this will be a vacation full of memories to cherish forever. 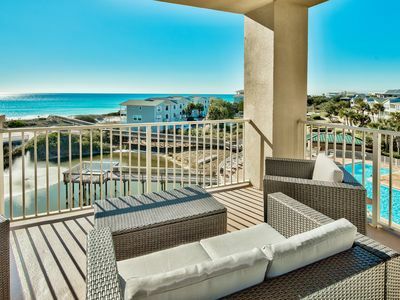 "Grayt Reflections" Gulf Views from Balcony! Quick Walk to beach! Fire Pit! 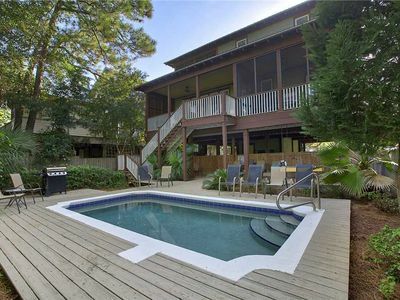 Seagrove, Community Pool, Close to Beach, Gas Grill, 3 Bikes! 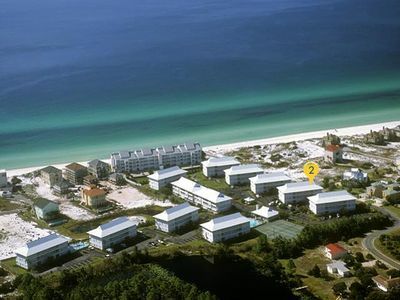 30A Getaway! 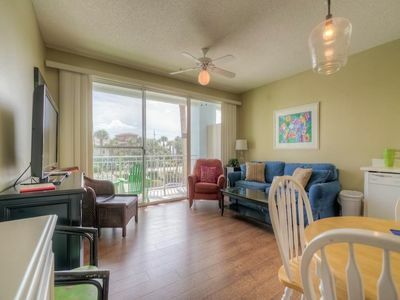 Spacious 4 Bed/3 Bath Condo with Pool/Fitness! Walk to Beach! 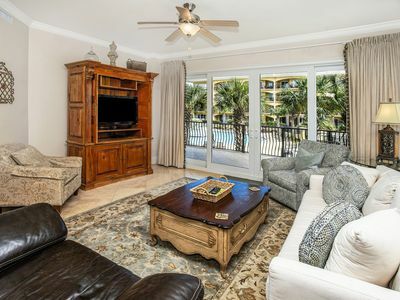 Lone Star - Heated Private Pool, Gulf Trace Community, Close to the Beach! 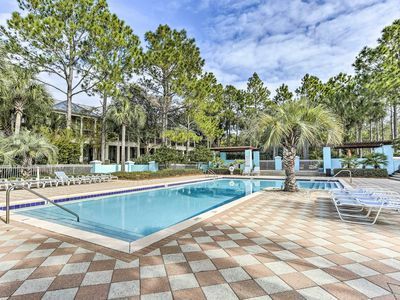 Absolutely Grayton - Private Pool, Heated Private Pool, Snowbirds Welcome, 30-A! Chic Santa Rosa Beach Resort Condo w/ Gulf Views!